Can you believe April is almost over!? We are finally having spring weather around here and today's outfit is perfect for this time of year. This unique floral peplum blouse from Nordstrom is both feminine and chic. I love how lightweight and flowy it is and the floral pattern is adorable! It's a great spring blouse but I'll definitely wear it throughout the summer on cool evenings, too. Unfortunately, it is sold out already but I also love these floral tops: here and here. You can't go wrong with open toe booties in the spring! My faux suede block heel booties are from Nine West and were purchased in the fall. They are super comfy and I love the taupe color (goes with everything!). Skinny jeans work really well with open toe booties...just cuff the bottoms if they are long! Booties are cute with dresses and skirts, too. I styled mine with a shirt dress a few posts back (check it out here). I also like these Nine West Peep Toe Booties (they come in cognac and black). My tan fold over clutch is from South Moon Under. I purchased it over the summer at their store in Rehoboth Beach. I LOVE this clutch and it matches everything! I'm excited to say it's currently 25% off and on sale for $29.99! If you are looking for a neutral clutch that is affordable, this one is it! It has a large outer pocket and another interior pocket (both with gold zippers) and removable gold chain. I kept my jewelry simple for this outfit so the top could take center stage! 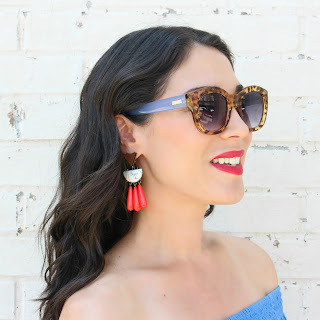 I stuck with the floral theme and wore my Baublebar floral studs. These earrings are no longer available, but I love their Crystal Ballerina Studs! There are so many options for earrings with this top. A gold hoop would also look really nice! Trust in the Lord with all your heart; and lean not on your own understanding; in all your ways acknowledge Him, and he will make your paths straight. Super cute and I love the sunglasses and earrings with this look! Such a cute top. I really love those shoes as well!! That floral peplum top is gorgeous as are the earrings and booties. A fantastic Spring look. Hi. Thanks for linking up. Would you like to co-host sometime? Such a cute top! We still need to set a coffee date.